Allrighty then! 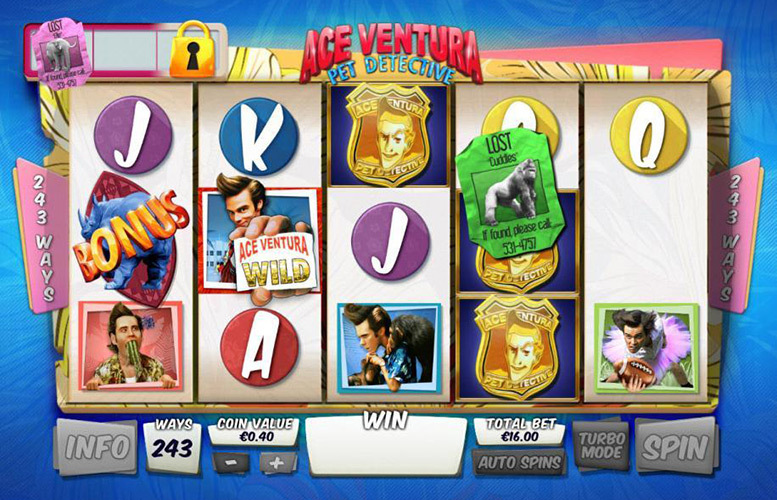 Let’s get to reviewing the Ace Ventura slot game from Playtech. Themed around the cult classic 1994 Jim Carrey movie of the same name, Ace Ventura is a five reel slot game which offers 243 ways to win, rather than traditional paylines. On top of that, the slot also packs in wild symbols, a bonus game and no fewer than three randomly triggered in-reel features to add to the excitement and provide extra ways for players to strike it lucky. The slot’s 243 different ways to win mean that there are few spins which don’t return at least some form of winnings. A whole host of additional features, including wilds and a bonus game, help to make gameplay really immersive and fun. Real sounds and scenes from the movie are included in the slot, and are sure to delight true Ace Ventura fans. Whilst delivering wins with good regularity, the size of those wins in the Ace Ventura slot are generally pretty small, with a top standard jackpot of just 200 x coin value. Staking options are comparatively limited, with players able to choose only from a limited number of betting options between 40p and £100. Elements of the game – especially its free spins and animal modifiers – are extremely difficult for beginners to understand. With 243 different ways to win and a host of extra features to boost winnings, Ace Ventura is a slot more tilted towards regular payouts and additional wins, rather than towards gargantuan one-off jackpots. As such, at face value, the slot’s top ‘payline’ jackpot is very disappointing compared with those offered by other slots. The jackpot is achieved by seeing five of the pet detective badge symbols align in a winning shape on the reels and pays out at a rate of 200 times the coin value. As the maximum coin value is just £100, the jackpot can therefore be worth £20,00. It should be remembered, however, that Ace Ventura does produce winning spins far more often than many slots and has a number of additional ways to win. Speaking of additional ways to win and to boost the payouts offered by the Ace Ventura slot, the game includes a whole host of additional features. These include a wild symbol, three randomly triggered in-game features and a bonus symbol that can trigger special free spins. Showing off an image of Ace himself holding up a card reading ‘Wild’, the slot’s wild symbol will substitute for all other symbols apart from the bonus symbol in order to make up the most valuable possible winning combination. 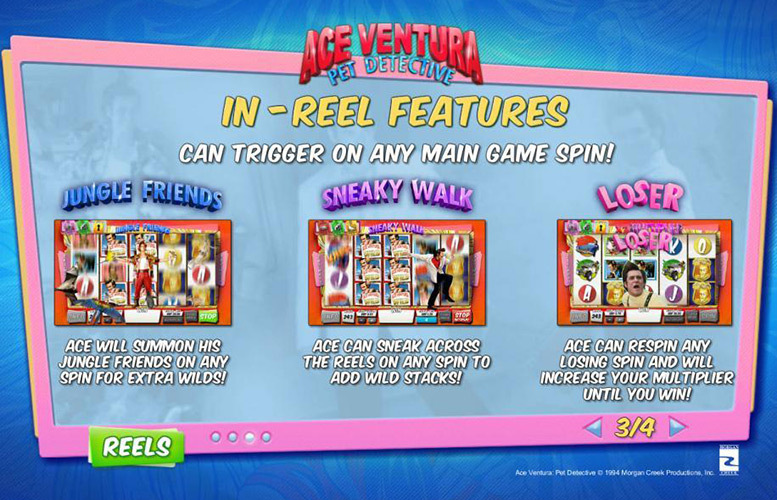 Triggered at different times during gameplay, Ace Ventura includes ‘Jungle Friends’, ‘Sneaky Walk’ and ‘Loser’ in-game features. The first of those sees Ace summon some animal buddies to provide extra wilds for a spin. The second occurs when Ace wanders across the reels, and adds wild stacks to a spin. The final feature is only triggered by a losing spin and sees Ace re-spin the reels, upping a player’s multiplier until a winning combination is revealed. Depicting a rampaging rhino, Ace Ventura’s bonus symbols trigger seven free games if they appear on reel one, three and five at the same time. 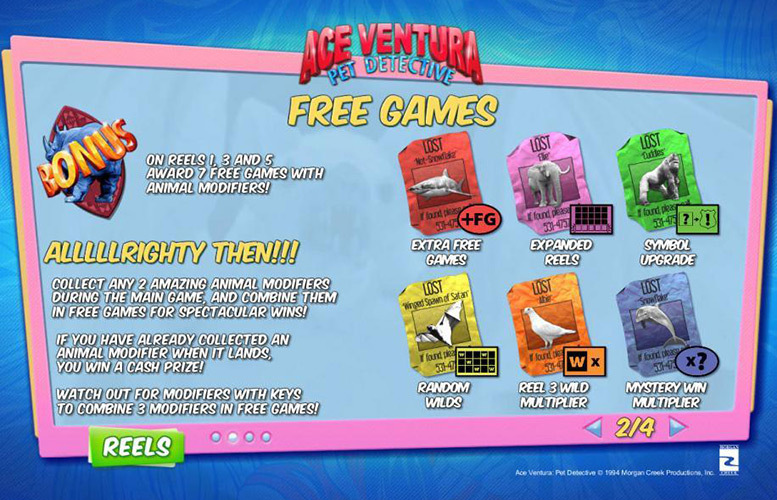 Those free games are then enhanced and given special features depending upon how many and which animal modifiers the player has collected through the main game. 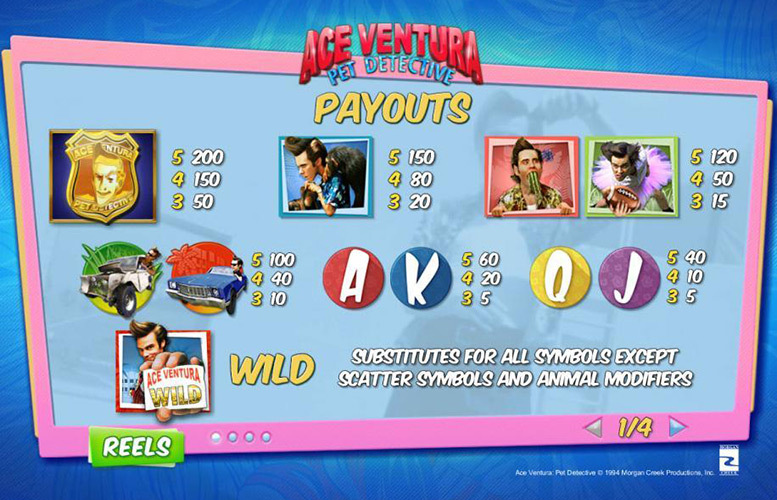 Entirely themed around the Ace Ventura movie, the slot’s most valuable regular symbols all depict recognisable features of or scenes from that film. As we’ve already mentioned, the pet detective badge is the most valuable symbol, but after that the most beneficial to appear are those showing events from the film. A five symbol combination showing Ace Ventura with two monkeys pays out at a rate of 150 times the set coin value. Similar combinations involving either the symbol showing Ace with asparagus in his teeth or playing football in a tutu, meanwhile, return jackpots worth 120 times the coin value. Adopting a 243 ways to win format, rather than traditional paylines, Ace Ventura players cannot alter their stake amount by de-activating any of these ways to win. The slot also has a set 40 coins per spin bet level, which cannot be altered either. What that means is that the only control players have over their betting amount, is their ability to alter the coin value per spin. A handful of different coin values are available to choose from, between the minimum of 1p and the maximum of £2.50. A minimum total bet of 40p is therefore possible, as is a maximum wager of £100. Ace Ventura is a slot game which is likely to divide players, with some simply adoring it and others not seeing the appeal. Firstly, of course, this is due to its very specific theme which will only appeal to those players who have seen and like the 1994 Ace Ventura movie. As well as the issue with theme, what’s more, Ace Ventura’s 243 ways to win format may well be polarising. Some players, after all, will enjoy the more regular payouts which the format delivers whilst others will be put off by the relatively small size of those payouts. What all prospective players will be able to agree upon, however, is that the slot’s gameplay is amongst the most immersive and interesting around. Betting control, on the other hand, can be described as amongst the most restrictive you’re likely to find. This game has a rating of 3 / 5 with 498 total reviews by the users.